I don’t really class myself as a Designer Diva, however, I do always seem to pick the most expensive item in the shop or fall in love with the out of reach prices for items in magazines. So the easiest way for me to work around this little problem is to buy items that have a good designer name behind them yet are more affordable for my pocket and in turn have the potential to become highly collectable. I suppose it all started some years ago in a department store. I often craved high end clothes and accessories and often returned home disappointed but one day I discovered Christian Dior limited edition make up compacts. More than affordable with a price tag of £30-£45 they ticked all the right collecting boxes as only a limited number are produced and each is an unusual design. Now, I frantically try and buy each one as it hits the stores, sometimes this is difficult as they sell out quickly but after some ringing around I can generally find one in a different store. Top Tip: Make friends with the representative on the Christian Dior make up counter as they know when the compacts are being released and can advise you what day you need to be in the store. 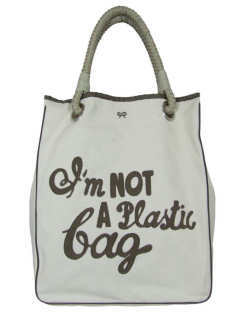 Unfortunately I missed the boat on these when they were released and haven’t been lucky enough to get my hands on one yet but I plan to the minute I have the funds.Another example of affordable designer bags was in 2007 when Anya Hindmarch released her ‘I’m Not a Plastic Bag’ for just £5. Seen on the arms of many a celebrity originally they were re-selling for as much as £400 although now a realistic price is £90-£100. I did queue from 5am outside a supermarket to get one and am really pleased I made the effort as this canvas bag is a already highly sought after and is set to increase in value. Top Tip: Join all the fashion websites newsletters as these let you know ahead of time what they are releasing – giving you the edge on what is coming out to buy. If trawling the internet and reading all the glossy fashion magazines isn’t your idea of sourcing items then don’t despair as you might be lucky enough to have a TK Maxx store in your local hi gh street. The shelves and rails hold a treasure trove of designer items at a fraction of the original retail price. I have had many bargains over the years from ceramics to glass and clothing to handbags. My most prized buy being a genuine Emilio Pucci handbag. I couldn’t believe my eyes when my friend and fellow writer, Vicky Hooper and I were cutting through the store a couple of summers ago. There on the shelf were loads of different Pucci print handbags. I grabbed the one I loved and happily handed over the £99 asking price as this bag would have cost me £300 plus if bought from a Pucci boutique or one of the concessions in the top London department stores. Top Tip: Always rummage through the China and glass in TK Maxx. I have purchased Murano and Ettore Sottsass glass vases, Marimekko china and little collectable ornaments by Jim Shore for a fraction of the price they should sell for. Another item which I own bought from TK Maxx is a glass Versace bottle stopper. Although Versace are better known for their clothing lines they have also produced ceramic tableware as well as glasses, ashtrays and other decorative items. Most carry the Versace logo of the Medusa head and this wonderful bottle stopper emphasises the head fantastically well. A snip at £15, if I had bought this in Italy or from one of the Versace outlets it would have cost me around £75. Many of you know I also have a bit of a shoe fetish but sadly my funds don’t always stretch to a new pair so when I stumbled across the Manolo Blahnik shoe horn I couldn’t resist it. Released a couple of years ago as a limited edition in Habitat stores across the country this stainless steel shoe horn had to be purchased. It resembles an elegant stiletto heeled shoe and cost just £35. It satisfied my appetite for buying a pair of designer Blahnik shoes yet also has become highly desirable with both collectors and those passionate about fashion.Collecting affordable designer is one of my most favourite passions. It gives me a great deal of satisfaction to know that I have managed to obtain something that has huge collectable potential but also didn’t cost the earth. In fact some of these items are likely to increase much faster than conventional collectables as the demand outstrips the supply.So just make sure that next time you are out in your local high street you pay attention to the designer names and take a closer look at what is on offer. I guarantee that if you track down an affordable designer offering it will more than satisfy your collecting tastebuds. 1. Designer and Celebrity Perfumes, the more innovative the bottle the more collectable. 2. Kitchenalia – Alessi has many top designers working for them and many of these items are sought after. 3. Celebrity Fashion – Kate Moss for TopShop and designers that create for Hennes always have key pieces in the collections that command a premium with collectors. 4. Handbags – Top fashion designers such as Matthew Williamson now produce affordable ranges in stores which are a fraction of their runway designed pieces. 5. Jewellery – look for good names such Vivienne Westwood who produce affordable jewellery designs. 6. Supermarkets – Designers have also designed sweetener packaging for Canderell and Westwood created a marmite t-shirt. 7. Compacts – Aside from Christian Dior, Yves Saint Laurent and Estee Lauder also produce limited edition compacts which are collectable. 8. Watches – Many designers have produced for Swatch and these now have collectable status.